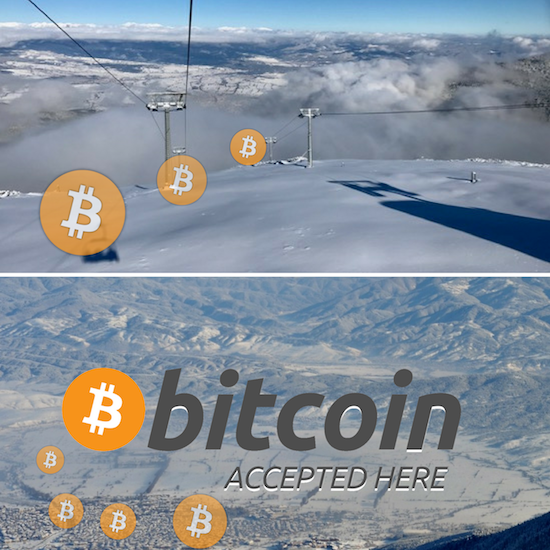 If you love bitcoin, then you’ll be pleased to hear that we can now accept it for payment for ski services. 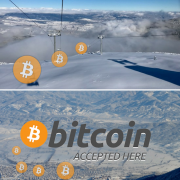 We accept bitcoin for your lift passes, ski hire, lessons and transfers. We also have 5 star hotel accommodation and ski package deal that can be paid with your bitcoin this winter. Contact for this bitcoin deal and other accommodation options. Or use the contact form in the bottom right of this page. To pay with bitcoin for ski hire, lessons, lift passes and transfers you need to save your online order and then contact me, lance at banskoblog.com. We’ll check your order and send you a payment request. If it’s transfers only (in-app) you need, then please put “pay by bitcoin” in comments box. PayPal fees vanish by paying with bitcoin. But you know that. If you’ve held your bitcoin for a period of time then you may have enjoyed some nice capital gains of 75% from 1st January 2016. At the time of posting this the bitcoin price is $780; that’s up 3x since September 2015. Most of all, I can see that in a few years time that travellers will be able to more widely use bitcoin to purchase many travel services. I also hope that Bansko will have the many more outlets for travellers to use their bitcoin. I would like to see a Bansko City mountain resort and a Bitcoin conference held here in conjunction with Coworking Bansko. So go ahead, use your bitcoin for your Bansko ski holiday. It makes it feel that it is (almost) free. NOTE: This is not an offer for you to invest, own or to speculate on bitcoin. Nor is this post any sort of financial advice. You’ll also find lots of links and info there too. By way as an incentive, you’ll learn how bitcoin can save you 15%+ on all your purchases on Amazon using purse.io. Bitcoin is often described as the internet of money or digital gold. It can be lots of things, but I’m fascinated if it will become more mainstream. Will more and more merchants in Bansko, and elsewhere in Bulgaria, accept it in they ears to come? Adoption and use is now in the stage of expanding from “sin” industries to mainstream companies. Already 200,000 businesses around the world accept Bitcoin. These range from digital agencies, computer companies, bars and restaurants and coworking spaces for digital nomads.